Following the constitutional Compromise between Austria and Hungary, Budapest experienced a phase of dynamic development. That was the period when the decision on the development of the area around Lánchíd (Chain Bridge) and under the Castle was made. The Neo-renaissance Várkert Bazár was built between 1875 and 1883 on the basis of Miklós Ybl’s plans. Itswell-balanced beauty still ornaments the bank of the River Danube.The group of buildings representing Romantic architecture, which has by now become part of the World Heritage originally had a commercial function, and was later used for cultural purposes. 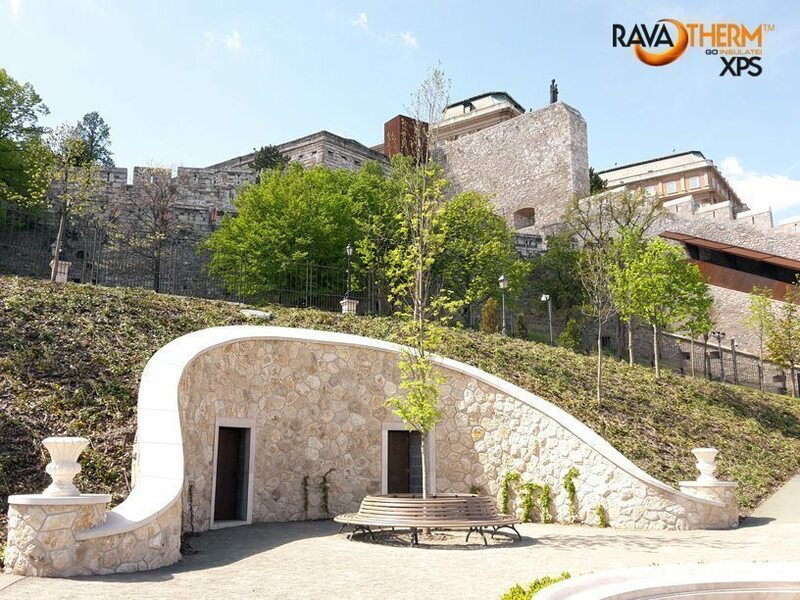 It was seriously damaged during World War II and its condition further deteriorated while it served as the Buda Youth Park from 1961. The site was declared dangerous for life safety and closed in 1984, which lead to further depreciation, and it was not unduly considered one of the most endangered historic listed buildings of the world since 1996. During the construction works it was important to preserve all the details of these buildings that have gone through so many adversities and to implement the original architectural concept as truly as possible.Since, due to functional extension, new subterranean parts of buildings were constructed and heated or tempered spaces to be used were created almost everywhere under the gardens, paths and steps, visitors wandering around the gardens or courtyards of the reconstructed group of buildingswalk above the blue foam – or RAVATHERM XPS thermal insulation – almost everywhere, even at the stairs leading up. The group of buildings considerably extended under terrain level also posed a considerable challenge for the insulating profession. At some points the perfect water insulation of the underground car park and spaces to serve visitors under construction had to be carried out working 10-15 m deep, and then, ensuring continuous protection for the water insulation, the gaps next to the newly built parts of the buildings had to be refilled without sinking to the earlier terrain level by intermittent filling and compaction. 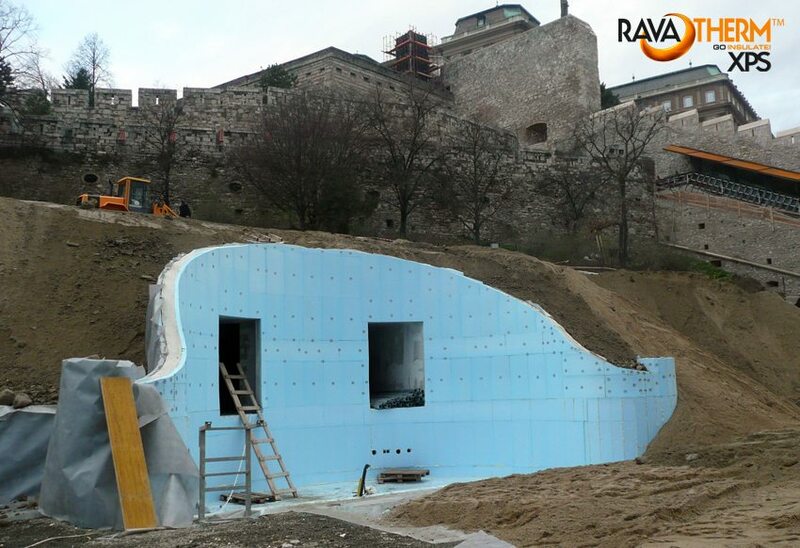 without deformation, and must protect water insulation from possible damages. 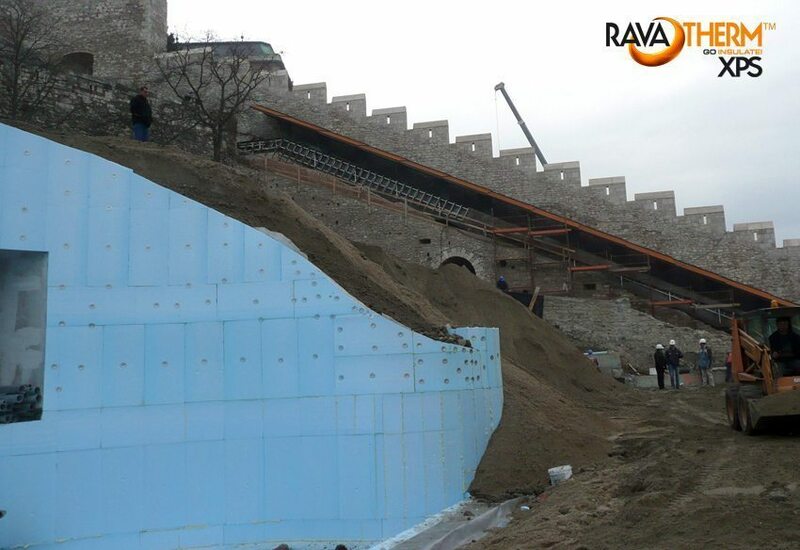 Since thermal insulation is also the outermost layer of the building and in contact with the soil, it must perform its task through long decades while also exposed to the direct effect of moisture. After looking for a material that can meet such complex demands, we chose the RAVATHERM XPS closed-cell polystyrene heat insulating plates. Closed-cell polystyrene foammay be installed as deep as 24 m, depending on the compressive strength.The completely closed material structure ensures the water resistance of the material.The heat insulating plates do not absorb a significant amount of water even in permanently moist conditions, therefore they retain their excellent heat insulating features even in extreme circumstances. 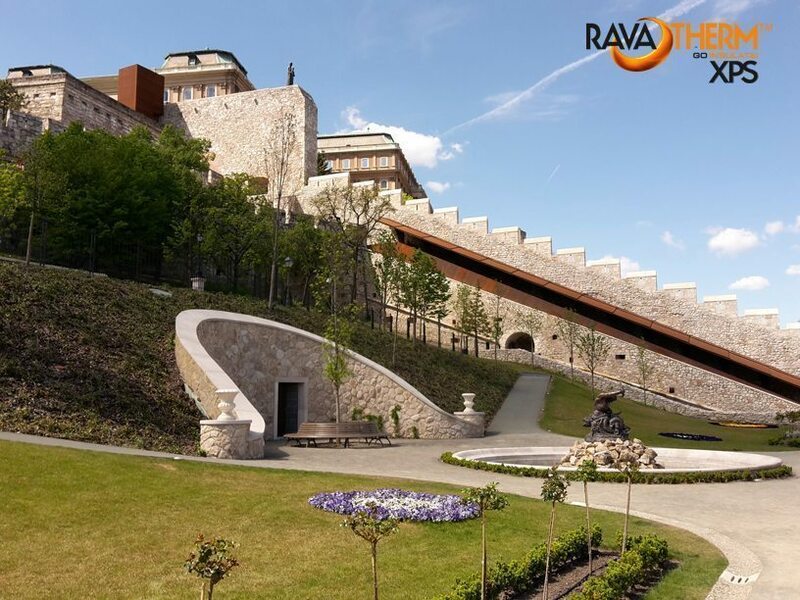 As the new building constructed in the belly of Várhegy exploits the characteristics of the area to the full and follows the original terrain level by its subterranean terraced structure,in order to ensure the continuity of the thermal shell, the thermal insulation follows the changing positions of the outer surfaces of the building, from vertical to horizontal and then back. Naturally, the horizontal parts were created pursuant to the design principles of the classic inverted roof; thermal insulation is directly laid on water insulation, covered with non-hygroscopicgeotextile and a ballast layer – green roof or terrace roof.